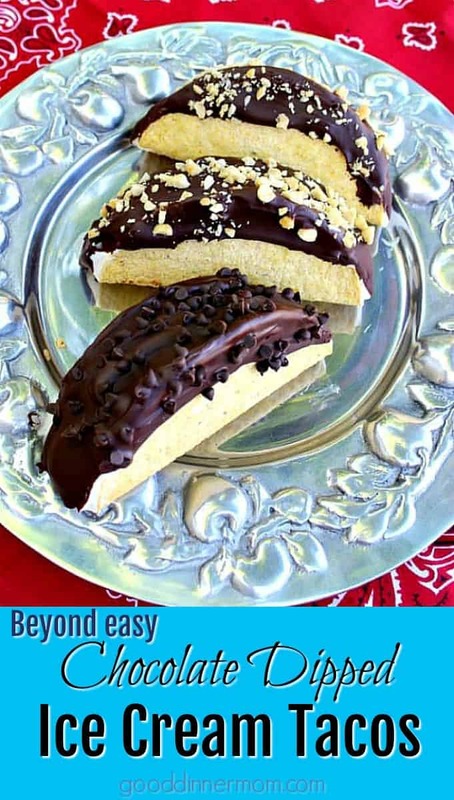 Here’s a fun way to serve ice cream treats to kids and grown-ups alike. 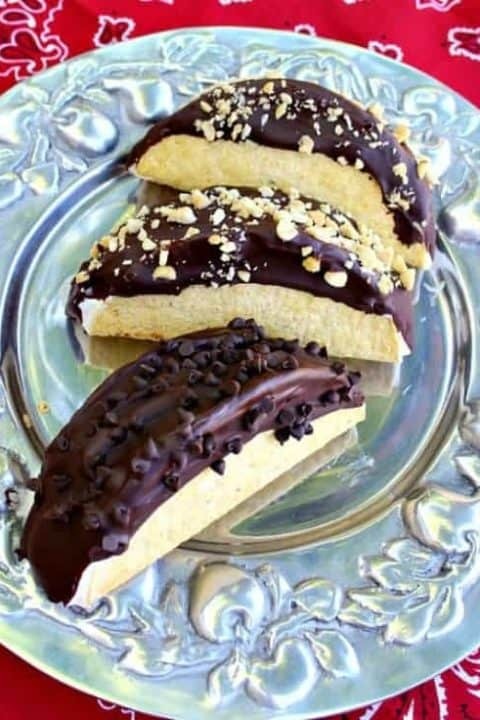 A nice departure from traditional ice cream cones, Chocolate Dipped Ice Cream Tacos can be customized to satisfy everyone’s frozen treat craving. Fill with your favorite ice cream and add additional novelties, nuts or even fruit. Quality counts here so use the best ice cream you can find. Breyers is my favorite because the ingredient list is short and I know what they are, nothing added that you can’t pronounce. 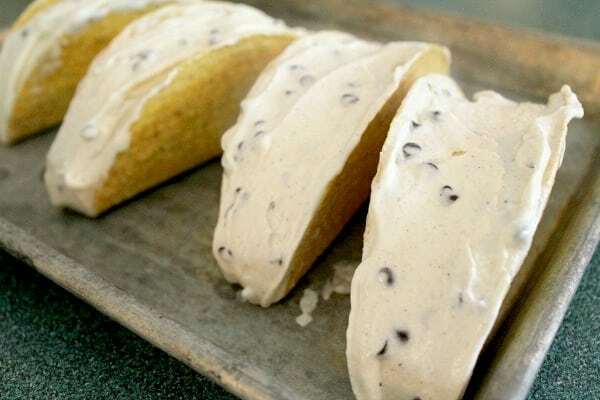 For my ice cream tacos, I added a bit of cinnamon and mini chocolate chips to vanilla ice cream because we love cannolis around here. After these were dipped in chocolate and sprinkled with peanuts, this became a fabulous sweet and salty treat. I softened the ice cream in the microwave until it was the consistency I needed to be able to fill the taco shells without having ice cream spill out. They then need to go into the freezer for at least two hours before they’re ready to dip in chocolate so be sure to plan for that. You can dip your tacos until the ice cream is totally covered, of just dip them a little. 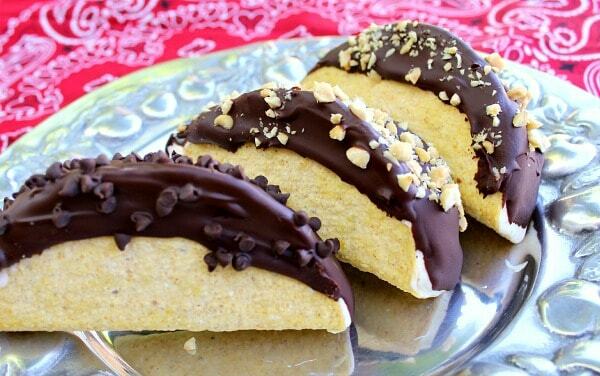 If you don’t like nuts, sprinkle extra mini chocolate chips on the tacos. I didn’t get a picture of the ice cream tacos in their wrapping, but I used quart-size, twist-tie plastic bags and closed them with pretty ribbon. Try these for your family or double or even triple for a crowd. These stay fresh in the freezer for about three days before the taco shells start to soften up and change texture. The taco is a hearty portion, so my husband and I share. You can also find mini taco shells for kids or dainty eaters. 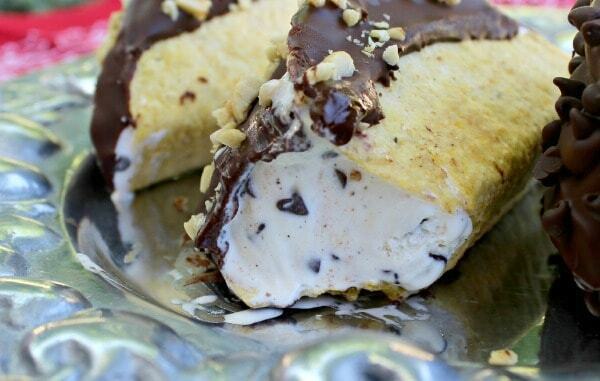 This recipe is the jumping-off point for chocolate dipped ice cream tacos. Add whatever other favorite ingredients and ice cream flavors you like. To serve at a party, I put each one in a twist top plastic bag and then twist tie them and store in the freezer or cooler until serving. 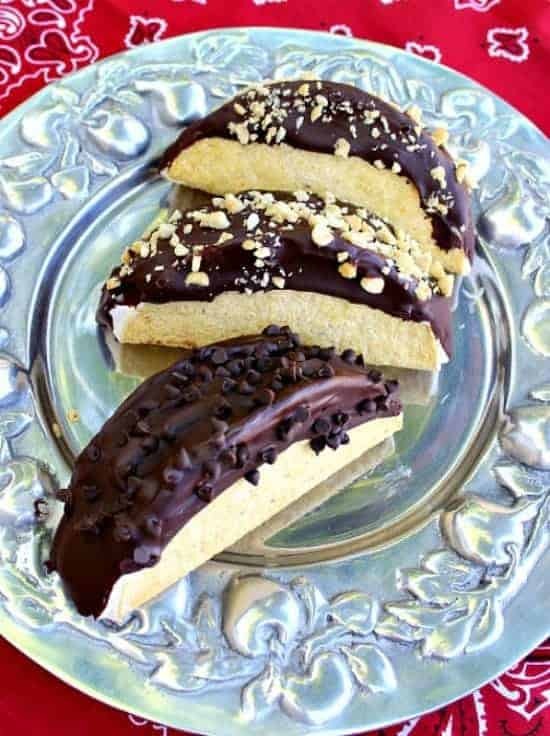 Fill taco shells with softened vanilla ice cream, and if making the cannoli recipe, add 1 cup mini chocolate chips and 1 teaspoon cinnamon. Freeze until hard, about 2 hours. Melt chocolate chips in the microwave, then stir in 6 tablespoons chopped butter and 1 1/2 tablespoons corn syrup. Dip the tacos in the chocolate, sprinkle with chopped peanuts and let harden, about 2 minutes. Place individual tacos into open-top plastic bags and then close with twist ties or colorful ribbon until serving. looks delicious!! Can’t wait to try.